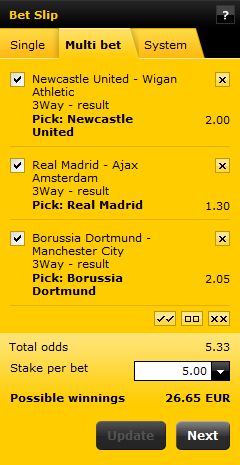 I am trying to come up with the most lopsided bet I could possibly do for the upcoming Barcelona vs Juventus final. I have a question about whether or not combining bets is possible. For this example, I'll use mostly made up odds. And I'll use the decimal representation of the odds. Say I will bet that Stephan Lichsteiner scores during this game. That's got 31/1 odds on Bet888. Also, I could bet that the game ends Juventus 9-0 Barcelona, which has odds of 500/1 on Bet888. Lastly, I want to bet that Andrea Barzagli will be man of the match. This has odds of 66/1. Is it customary to combine the odds? So if I wanted to bet that all three of these events happen, would I get odds of 500*66*31/1 = 1023000/1 ? Or does it depend on the rules set by the betting agency, or is there a maximum of two simultaneous events? I ask because I read somewhere that the man that bet $50 on Brazil losing 7-1 AND Sami Khedira scoring won a lot of money and I want to see how his winnings would be calculated. The bets of this type are called are called combo bet, accumulator bet or parlay bet. The odds are multiplied, exactly as you wrote in your post. You can also find several examples in the Wikipedia article about such bets. It is probably worth mentioning that some bookmakers do not offer accumulator bets at all. For example, betting exchanges typically only offer single bets. You can usually find the exact rules and detailed information also on the bookmaker's website. Let us take one random bookmaker - you can see that they say in their rules that odds for multi bets (which is the terminology this bookmaker uses) are obtained by multiplying the odds of the individual picks. They also have winning limit in their rules - meaning that bookmaker simply will not let you make a bet should the total win be above some given amount. There is also minimum stake which you can wage. In practice this means that you cannot combine too many bets to obtain extremely high odds, since you would get payout above winning limit already for the minimal possible stake. The picture below show the example shown in the help on this bookmaker's website. Obviously these two bets are correlated, because if they win by 3 goals, they will certainly win by 2 goals. They will not let you parlay these and get 15:1 on your money. This is an obvious example, but usually to be safe they won't allow two bets on the same sporting event into a parlay. The majority of the available bets provided by the bookmakers offers may be combined freely. There are a few exceptions such as certain Formula 1 bets that can only be placed as a single. It all depends on the bookmaker you choose to bet with. I am trying to keep an eye an all the tipster sites to get all the best bets. Not the answer you're looking for? Browse other questions tagged football betting champions-league or ask your own question.